These tips are provided as a general guideline as to what you should be doing in your gardens every month. Where you live and weather are contributing factors. As part of our maintenance services, Churchill Gardens experts can maintain your gardens all year long. Clean out your flower beds. Begin by removing any debris that may have fallen into the garden over the winter. If plants were not cut back in the fall you will need to remove any dead foliage, stems, flowers etc. Lightly rake around the plants to loosen old mulch and soil. When you are sure the garden areas are clean, apply fertilizer around base of plants. We prefer to use a granular organic fertilizer that is available at our garden center. Add a new layer of mulch at a depth of 2-3 inches to retain moisture, inhibit weed growth and add organic matter to the soil. If you are planning on starting a new garden this year, now is a great time to remove the sod from the area. The ground is softer now and will be easier to remove. When all of your sod is removed, we recommend checking the soil structure. Do a soil test if necessary. Amend your soil with recommend ingredients. Begin your wish list for new plants and other garden items you may want this year. (the garden center opens May 1st). If you haven't already, follow Aprils list. When purchasing new plants make sure that you select healthy ones. Choose full pants with lush foliage. Avoid tall spindly plants with pale foliage. Make sure the plants that you choose are right for the area in which they are to be planted i.e. light, soil conditions etc. Begin to plant perennials. Unlike annuals where you need to make sure the chance of frost has passed, most well-established perennials can handle a light frost. If you are planting a new plant started from seed it should not be planted this early. Dig your planting hole wide and deep enough to accommodate the plant. Check the tag on the plant and ask the knowledgeable staff at Churchill Gardens, Inc. for specific planting instructions. Start enjoying watching things grow. Pull or dig out anything in your garden that is not supposed to be there. Weeds and grass only compete with garden plants and the sooner they are removed the better. Remove dead or diseased plant parts. Sometimes only part of the plant has a problem, if you get rid of it soon enough you may save the plant. Deadhead! Once a flower has bloomed and gone by the plant will continue to send nutrients to it, by removing dead flowers you are allowing all the plants energy go to healthy parts of the plant. Your garden is looking beautiful right now. Continue weeding and removing flowers that have gone by. If drought conditions exist, water as recommended. Pour a glass of lemonade, pull up a chair and enjoy your hard work. Continue with your routine maintenance of deadheading and weeding. Consider adding some rudebeckiar sedum if you don't have it already for some beautiful fall colors. September is a great month to "Divide and Conquer" - To some this time of year seems like an ending as flowers go by and many of our plants look as though they are on their way out, but in reality it is also a beginning. Now is a great time to revitalize your garden. To begin, clean your plants by removing any flowers or foliage that has gone by leaving only what is green and healthy. You may be surprised at the new growth you see coming along. Some of your perennials may need to be divided or as it is sometimes called split. Dividing is making two or more smaller plants out of one large plant. When plants become to crowded they do not get the right amount of nutrients, air circulation or water and therefore do not grow as well. 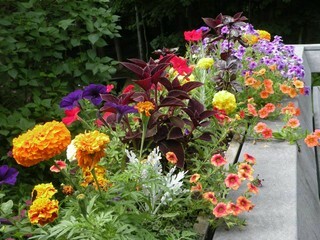 Some common plants that respond well to division are Daylily, Hosta, Iris,Rudbeckia and Phlox along with many others. After a plant is done blooming it can be divided. For most you can simply take a shovel and remove a section of the plant. Plant your divisions elsewhere in the garden or share them with a friend (They will love you!). It is also a great time to plant new plants. We hope that you have been successful and have enjoyed your garden this year. Now as cold weather is just around the corner it is time to as we say, "Put your garden to bed." The more fall cleaning you do, the less work you will have in the spring. As we talked about last month it is important to cut back many of your perennials. As the plant stops blooming and you begin to see new basal foliage ( new growth around the base of the plant) it is time to cut back everything but that new growth. This way the plant can use all of its energy to develop a healthy root system to help it through the winter. Weed your garden one final time. (again less work in the spring) Rake any debris out of the garden i.e. leaves, sticks etc..